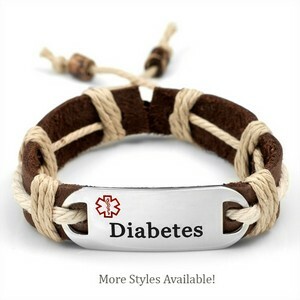 These adult leather diabetic bracelets, which can adjust from 6 1/2 - 9 inches, come pre-engraved with the word Diabetes on the stainless steel plaque. The band is a dark brown leather with a rope accent that is rust, gray-green, green, or natural colored. Keep in mind that this bracelet is not waterproof. It best fits wrists that are the same size as the bracelet.